The technology allows battery manufacturers to produce lithium-ion batteries at a much faster pace, with much less floor space and carbon footprint, therefore providing significant cost savings. Now available for commercial applications, Miltec UV will be taking their innovative technology and expanding to the US and international markets in 2018. Their advanced R&D lab also welcomes manufacturers for testing. Miltec UV has been servicing the UV industry for 28 years and sustaining its global leadership in manufacturing for both arc and microwave ultraviolet curing systems. 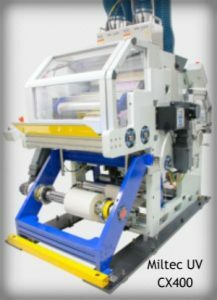 They offer standard UV equipment and custom designed systems to interface with existing or new manufacturing production lines. For information, you may contact Sales at 410-604-2900 or visit their website at www.miltec.com.